Your DGB for today is to consider boycotting the NFL. Last year, San Francisco 49’ers quarterback, Colin Kaepernick, drew attention for choosing to kneel during the National Anthem. His reason was a protest of police brutality in addition to the song being a racist holdover from slavery days. (He’s correct; check out the cringeworthy backstory here.) Kaepernick became a free agent in the spring of 2017 and as of today has still not been signed onto an NFL team. According to FiveThirtyEight, that is the longest time that a player of his abilities has been unemployed, ever. Contrast that with the long and befuddling list of rapists, domestic abusers, animal torturers, and terrible players that DO have NFL jobs. Excuses for his lack of contract are no less confusing and include his vegan diet and his haircut. 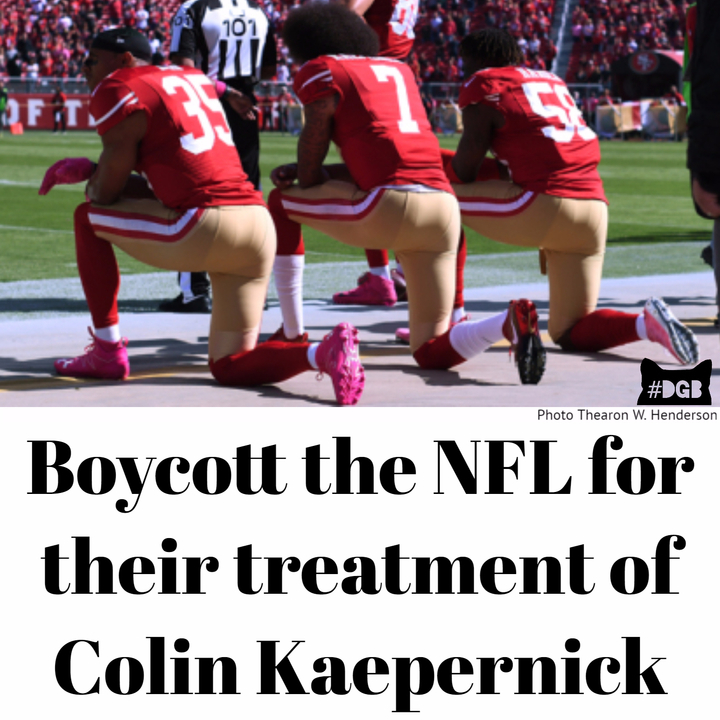 This comes with the recent findings regarding brain damage suffered from years of professional football play and facts that point to Black players being particularly at risk. Folks, it’s time that we demand better treatment of those working so hard to entertain us. The camel’s back is as broken as it needs to be - it’s time to take a stand. Use your valuable viewing eyes to catch up on some Netflix, and use your fan dollars to support Colin Kaepernick (merchandise available here) and other players joining him in protest. Grab back and demand better for our teams.